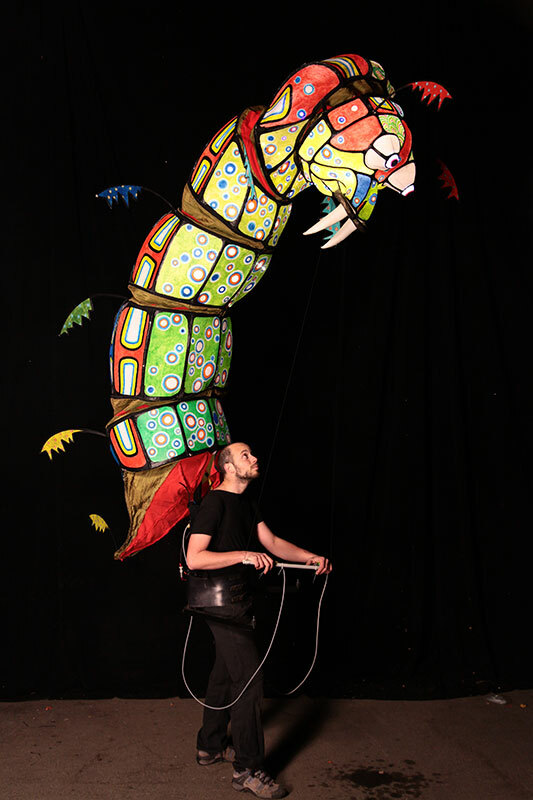 Allebrilles, is a luminous strolling street show, combining masks and large puppets. 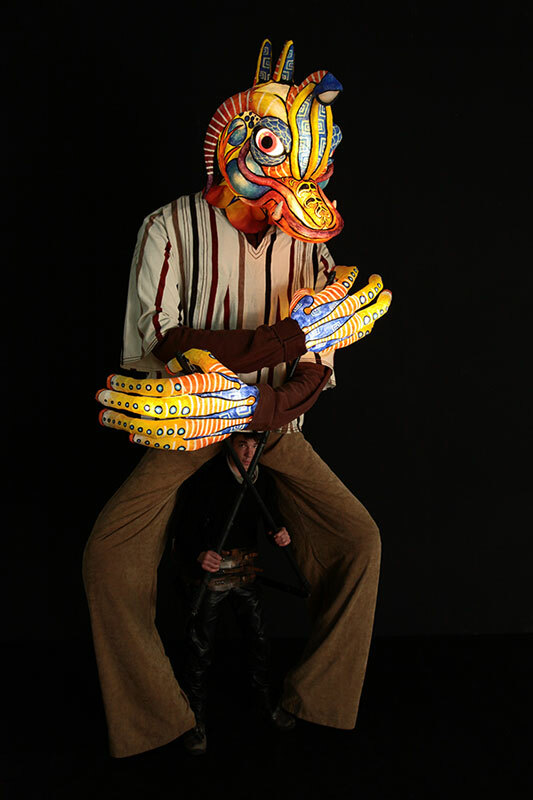 It draws its inspiration from Mexican Alebrijes, papier mâché chimeras that are especially dreamlike and colourful. The light is transmitted from one character to another, from one giant puppet to another, just like affection is communicated from person to person. 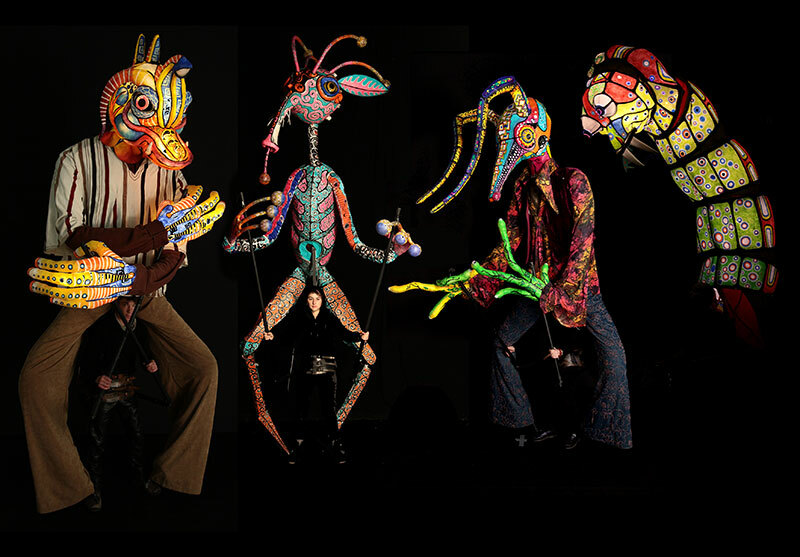 Soutiens : Allebrilles was created within the framework of the Fête des Lumières in Lyon with the support of the CNAR Frappaz / the Invites de Villeurbanne, the Noche de los Alebrijes and the Museo de Arte Popular of Mexico City, from Décor +, Subsistances, the Musée Gadagne, Pezl and Toshiba. 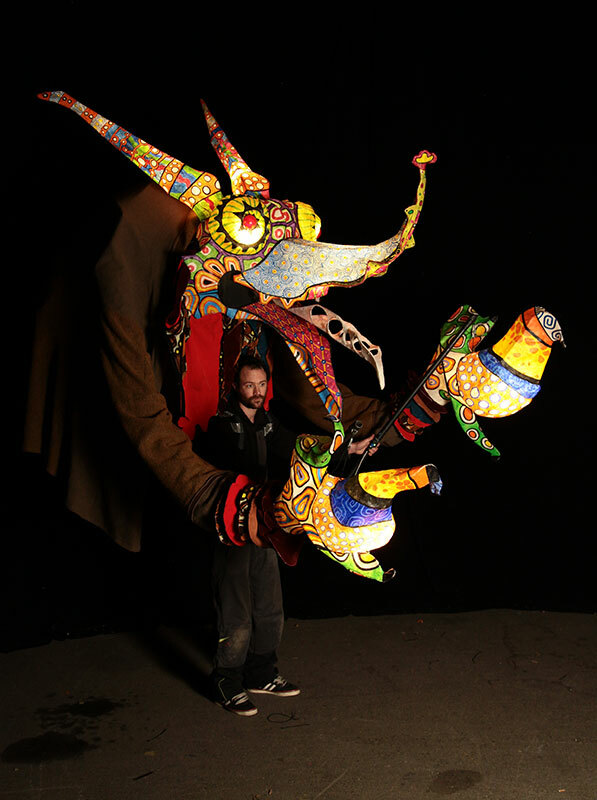 Allebrilles, is a luminous strolling street show, combining masks and large puppets. It draws its inspiration from Mexican Alebrijes, papier mâché chimeras that are especially dreamlike and colourful. A fantastic ballet is organised around a bedroom set up in a public space, where laughter and childish fears meet. Parade des Allebrilles - Fêtes des Lumières 2013 from Blog des Lumieres on Vimeo. Allebrilles is an opportunity to reflect together about the imaginary, about fear; but especially about folk cultures and their creations designed to terrify and delight children. With the complicity of the light, a revealing element that both exposes and proposes, Allebrilles aims to publicly fight off anxieties and stamp out darkness, celebrating the happiness of being outside together. Thus, light does not rush in, it is transmitted from one character to another, just like knowledge and love are communicated from individual to individual. It shares its colours and weaves this essential bond that calms, soothes and is an invitation to the fête. When the night lights up, it’s time to dance and play. The “alebrijes”, these Mexican statues of fantastic creatures in vibrant colours, owe everything to Pedro Linares (1906–1992), without him the word “alebrije” would not exist. In Mexico City, Linares made cartoneria, which are varnished papier mâché objects, intended for specific festivals. According to legend, in 1936, he was seized with an intense fever during which he had a vision. He was travelling in a natural landscape where the elements were transformed into chimerical animals of incredibly bright colours, screaming the word “alebrije”. Once recovered, Linares tried to produce the creatures that he had seen during his vision. Over the years, the growing success of his sculptures drove his descendants, then many others, to also fabricate alebrijes. The works of Linares fascinated the painters Diego Rivera and Frida Kahlo, who commissioned several pieces from him, exhibited at the Anahuacalli Museum in Mexico City. Today, the tradition launched by the Linares family has become a major activity. In addition to Mexico City, it is mainly in the State of Oaxaca that one finds entire villages devoted to the creation of alebrijes. The mission of the Museo del Arte Popular, housed in an Art Deco building since 2006, is to promote and conserve Mexican folk art. In over 7,000 square meters are displayed the works from its permanent collections, made of materials ranging from papier mâché to basketry, woodcarving, metalwork, textiles and even sugar sculptures. The museum also organises temporary exhibitions and workshops for young people. In the month of October, every year since 2007, in collaboration with the Conaculta (National Council for Culture and Arts) and Mexico City, the MAP has been organising a parade of giant alebrijes accompanied by a contest that celebrates traditional Mexican arts. Once the parade is over, the giant sculptures remain on display for two weeks. Allebrilles, is a luminous strolling street show, where fixed scenes of about 5 to 10 minutes alternate with wandering tableaux. It was designed for nocturnal performances and requires semi-darkness, but can work with urban street lighting if not too intense. Lasting from 60 to 90 minutes, it is designed to adapt to the architecture of the venue as well as to the requirements of a festival. Thus the fixed sketches can be played on squares and crossroads, or they can be grouped together on stage for 25 minutes. Residencies can also be organised beforehand to integrate a group of local people into the performances. Nine luminous puppets from 3.60m to 4.30m whose lighting is controlled by the manipulator thanks to commands fixed on the sticks. 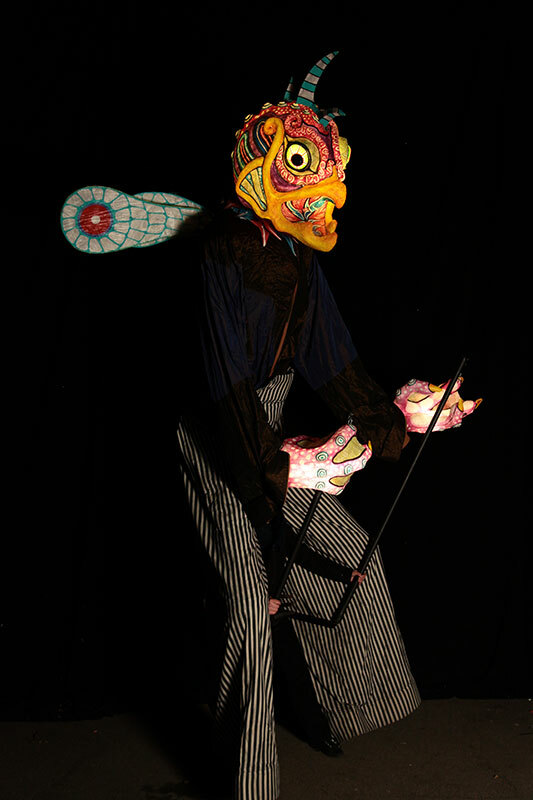 A 4 m non-translucent puppet represents the mother of the toads. She is illuminated by the bedside lamp that she carries in her hand. Two masked characters of human size. Each mask lights up through a way chosen by the actors. A rolling and oversized bed serves as the stage for our two little toads. Dimensions: 2.4m W x 2.60m L x 2.50m H. The bed is manipulated by two bedside-lamp men wearing lampshades on their heads. The bed’s lighting system is controlled by a lighting engineer. A vulnerable and quivering luminous rolling, articulated dragon. A percussionist and his drums are set up on its back. Dimensions 2m W x 5m L x 4.5m H. This float is also equipped with a broadcast system controlled by the musician. The float is moved mechanically by two manipulators. The light system and the smoke machine are controlled by one of the two manipulators. Fourteen people fitted with luminous masks accompany all of the elements of the performances. They work in one or two groups. Agile and rapid, they weave their way through the crowd to clear performance spaces so that the voluminous elements can be set up. Some of these mischievous and rascally characters can be interpreted by local residents after rehearsals. The group can be completed by new masks created during the participatory workshops. The show is essentially visual, without words, giving pride of place to dancing and is backed up by both a soundtrack and a group of musicians who give rhythm and structure to the whole. The music highlights the puppeteers and actors. Allebrilles is usually accompanied by Braka, Thomas Sisquelle and En’s Batucada. The soundtrack is broadcast by autonomous speakers set up on the dragon Picphon. Sometimes the performances can integrate local musicians who have earlier participated in a workshop on writing scores and taken part in rehearsals. For more than fifteen years, Les Grandes Personnes company has stressed participatory activities and collective work. Its creations involve a pooling of energies and an exchange of skills. Thus, one or more groups of local residents can integrate the spectacle by participating earlier in certain workshops. Motivated local adults can learn to manipulate the giants, to tame these papier mâché titans who will permit them to dance with a new scope and to taste the giddiness of having extra-long arms. After a few rehearsals and manipulation sessions, they can participate in the parade as part of a pair with a company puppeteer. Adults and teens, for example, can make luminous helmet masks by assembling transparent plastic objects, bottles, receptacles and other packaging that can be recycled. These masks will then be papered and painted with translucent colours. LED lights controlled and powered from a case worn on the belt make it possible to illuminate them when desired. In the same way, various luminous choreographic objects can be created. These construction workshops will be followed by rehearsals to allow locals to integrate the show’s performances. Supervised by Braka or by the percussionists from En’s Batucada, experienced amateur musicians, music school or conservatory students, for example, could work around the scores of the shows and accompany the performances. 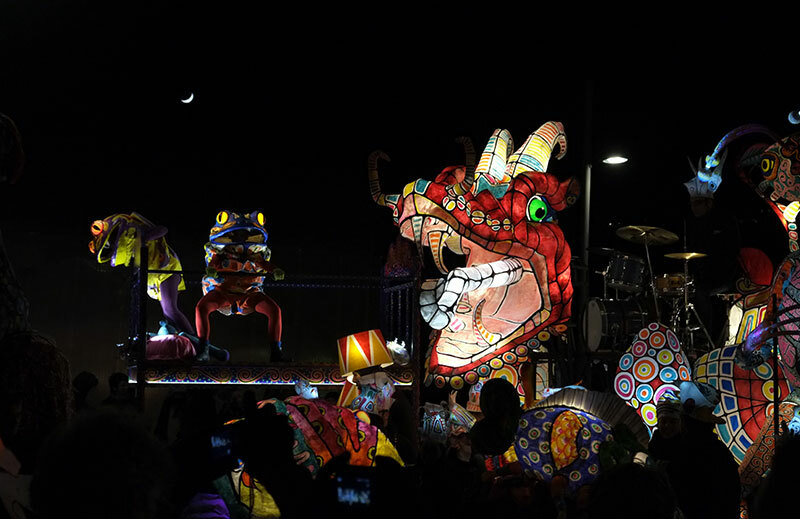 Allebrilles was created as part of the Fête des Lumières in Lyon with the support of CNAR Frappaz / Les Invites de Villeurbanne, the Noche de los Alebrijes and the Museo de Arte Popular of Mexico City, the Fabrique Sonore, Décor +, Subsistances, Musée Gadagne, Pezl, Toshiba and the Villa Mais d’Ici. The making of a video of the show is in progress.